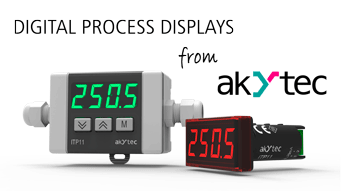 Process displays from akYtec are distinguished by their compact and exclusive design. The unique combination of the rectangular front and the cylindrical rear of these devices make them benefit a lot in many aspects. The cylindrical mounting part of the device enclosure allows akYtec’s displays to be installed into a standard cutout of Ø22.5 mm, which reduces mounting area and provides faster mounting if compared to traditional rectangular devices of this kind. The very same cutouts at control cabinets or panels are used for mounting standard signal lamps or push buttons. Besides the installation into a panel or control cabinet with minimum space requirements, these displays can even be easily installed into a push-button box due to their short length (65 mm). The rectangular front of 48 x 26 mm provides much more area for the displayed characters than those completely cylindrical Ø22.5 mm enclosures. The measured value is displayed with characters of 14 mm high on a 4-digit 7-segment LED display, which is IP65-rated, meaning, it is protected against water and dust. Depending on the input signal, 4 types of displays are available: ITP11, ITP14, ITP16 and SMI2. - Setting the password to prevent an unauthorized access. All the configuration features of the ITP11 are also supported by the IPT14. All the configuration features of the ITP11 and ITP14 are also supported by the IPT16. The SMI2 is a universally-applicable display unit for monitoring industrial processes over the RS485 interface via protocol Modbus RTU/ASCII. This display can operate either as a slave or as a master device. This enables implementing simple and cost-effective visualization systems meeting a wide range of customer requirements. The SMI2 can also be installed in a remote control panel in order to display the necessary control values close to the operator.